An award-winning, variegated yucca for instant garden impact. Absolutely spectacular! - introducing, a low maintenance, award-winning, exotic garden plant - a superb choice for drier gardens and Mediterranean-style designs. Grow this superb variegated Yucca 'Colour Guard' and you're assured of an all-round garden-worthy plant and a solid, reliable performer. With spectacular 1-2m tall flower spikes produced in summer, this variegated Needle Palm is a dream! More compact variety of Yucca, it reaches around 150cm high so won’t outgrow a large pot or overshadow other plants. Supplied as an established plant in a 10L pot, ready to plant out or pot on. An absolutely spectacular addition to your garden! 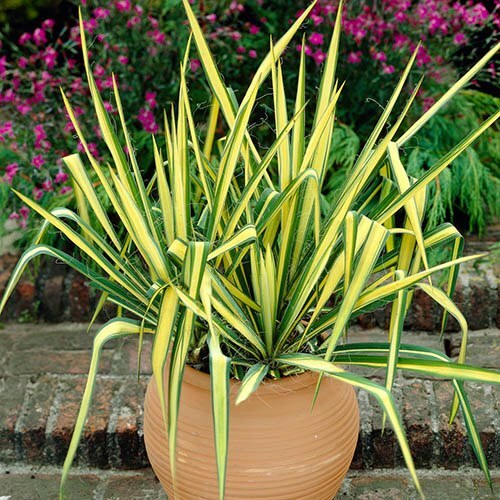 A low maintenance, exotic garden plant, 'Colour Guard' is a variegated Yucca which forms rosettes of evergreen leaves with a broad, central, pale yellow stripe. Hardy to -10C, and holder of an RHS Award of Garden Merit, you can be assured that this is an all-round garden-worthy plant and a solid, reliable performer. A superb choice for drier gardens and Mediterranean-style designs, 'Colour Guard’ is not as spiky as other Yucca varieties, so is also a much 'softer' option for your garden. In mid to late summer, especially during hotter years, bell-shaped, creamy-white flowers are produced on 1-2m tall stems which add to the overall beauty of this award-winning, Mediterranean gem. More compact than other varieties, this variegated Needle Palm reaches around 150cm high so won’t outgrow a large pot or overshadow other plants. Supplied as an established plant in a 10L pot, ready to plant out or pot on, approx 70-100cm tall, flowering age. Big! For best results, grow the plant in a container that can be moved outside in warm summer months and then given winter protection against the worst of the weather. If growing in a container, add 20-30% of extra grit for good drainage. Place in full light, water freely during the growing season from April to September and apply a balanced liquid feed fortnightly. During winter don’t feed and water sparingly allowing the surface 5cm of compost to dry out between watering, then water thoroughly, making sure that surplus water drains through the pot. Pruning is not normally needed, but damaged leaves and spent flower spikes can be removed as necessary in the spring.